← I have kitty cat paw print analog stick covers on my Vitas. Valkyria Chronicles is a really good object lesson in why I shouldn’t pay full price for games before I’m actually in the mood to play them. My sole justification is that I got conditioned, during the PS1 and PS2 days, to buy JRPGs the instant I saw them in the shop in order to avoid needing to pay collector’s prices for them later. So, yes, I spent sixty bucks on the PS3 version, opened it to watch the intro, never actually started it, eventually bought the Steam release, and sold the PS3 version for, well, barely enough to cover the cost of the Steam version. Then I didn’t play THAT for a couple of years, long enough to see a PS4 remaster released. It was starting to get a little embarrassing. Part of the reason for my reluctance is, well, while it’s a really pretty game – the pencil-shaded art style is unlike anything else – it’s also a strategy RPG and those scare me a bit. I absolutely loved the Shining Force games, back in the Genesis days, but the genre is one that demands a ton of time commitment just to play through a single encounter and one where failing at a battle often means playing through the whole thing all over again. 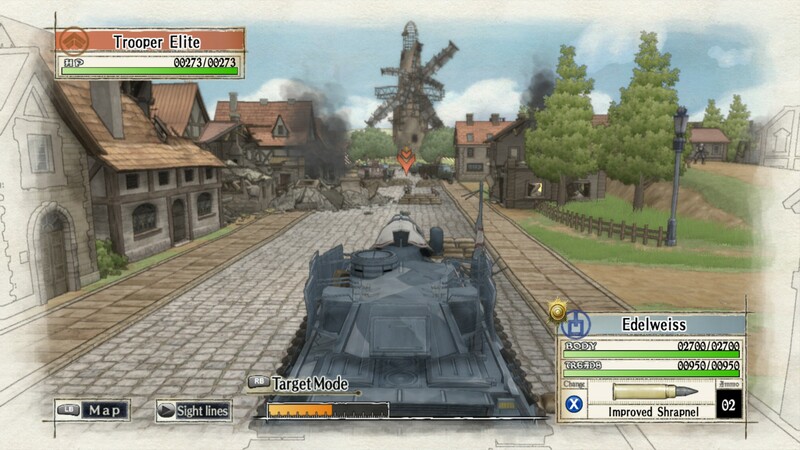 This is your tank, the “Edelweiss”, and losing it in any fight means an instant trip to the Load Previous Save screen. Unfortunately, the designer put a giant glowing weak spot on the back side, so you need to be sure that your ground troops prevent anyone sneaking up on it with a rocket launcher. And yes, Valkryia Chronicles is no exception to either rule, though the ability to save mid-battle does ease some of the sting of defeat – and I did see the GAME OVER screen a lot, including during some very early missions. The difficulty curve is all over the place, and it’s reflected in the achievement percentages for the game – barely 20% of owners on Steam even make it to the half-way mark. It’s a more dynamic game than a lot of strategy RPGs – while you are still basically moving counters around a hex grid, with movement distances and firing arcs and terrain effects and so on, the Avalon-Hill-esque underpinnings are cunningly disguised by being able to move your troops in real-time third-person view. Each of your soldiers also comes with a ton of background and advantages and shortcomings – you don’t have Scout A and Engineer B, you have Nancy the Scout, who grew up on a farm and is extra effective when fighting in natural settings, but also clumsy to the point where she frequently drops grenades and Ramsey the Engineer who is a daft hand with machines but is terrifically lazy, to the point where she will occasionally get an enemy in her sights and then just say “meh, whatever” and not bother shooting them. Clumsy or no, glasses AND pigtails? She goes in the squad. They’re also all individually-voiced and the voice actors do a great job of putting personality into their mid-fight chatter. Well, the Japanese voice actors, anyway. I can’t speak to the quality of the English dub. I use Nancy and Ramsey as examples because, well, the army in this barely-veiled World War II analog is very egalitarian, and my deployed troops in any given mission tended to be about 70% women. It would have been 80%, but I had a soft spot for Oscar the sniper who was drafted despite being 15 and who has a scar on his forehead from roughhousing with his brother. …I may have gotten a little too into my squad. 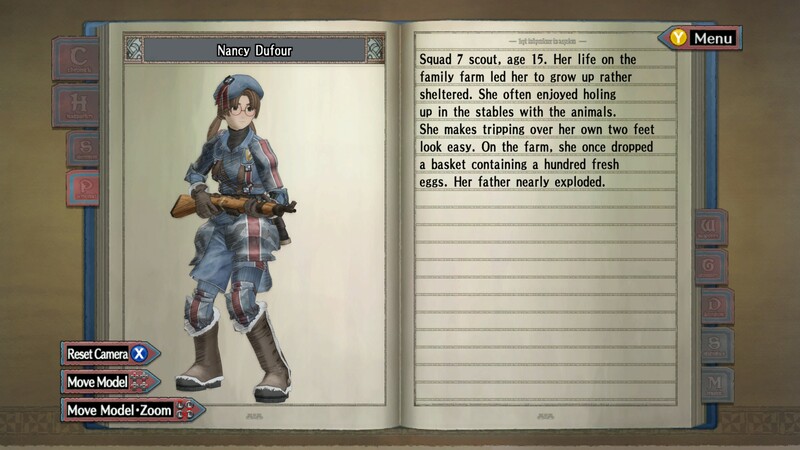 Despite the pastel colors, Valkyria Chronicles doesn’t hesitate to hit you with some very heavy topics. One of the game’s major themes is racism, and your tank driver is a member of a particularly-maligned minority – which would be bad enough, if you didn’t also have some troops under your command who hate her for that, and other troops whose personality traits include lowered combat effectiveness if they’re forced to fight near someone they hate. And you’re the good guys, because at least you’re not rounding them up and putting them into concentration camps to be worked to death. There’s some stuff here that wouldn’t be too out-of-place in Spec Ops: The Line, is what I’m getting at. Anyway, if you can deal with the inconsistent difficulty and the occasional emotional swings, it’s a heck of a game and you should probably buy it on one of the many systems it has been released for. I recommend Steam, because it will probably be on sale for five bucks or so at any given time. This entry was posted in PC Gaming, ps3, PS4, videogames. Bookmark the permalink. I tried to like this game, I really did! The art is cool, the story is engaging (I like how there are scenes that have you develop sympathy for the enemy soldiers), and some of the missions are fun. But the trial and error aspect of some of the stages annoyed the hell out of me. Picking a squad before knowing what you’re up against might be realistic, but having totally the wrong composition and failing to try again with the correct set up felt like a huge waste of time for me. I got fed up of that and quit after about 10 hours. From looking at achievement rates, you are far from alone in dropping it! Every mission has a pre-mission briefing, so it would have been a perfect spot for your commanding officer to say something like “you’ll need to cover a lot of ground, so lancers and snipers might not be great choices” or “the enemy has heavy armor, so plan accordingly”. Yep! Things like that would be useful. The mission where you have to destroy the turrets on the side of the huge tank gave you enough warning, so I went crazy on Lancers. Other missions lacked that information so it was time for me to leave it. I enjoyed some of it at least.